Have you ever noticed that the plastic eggs that we buy at Easter time seem to multiply, substantially, from one year to the next? 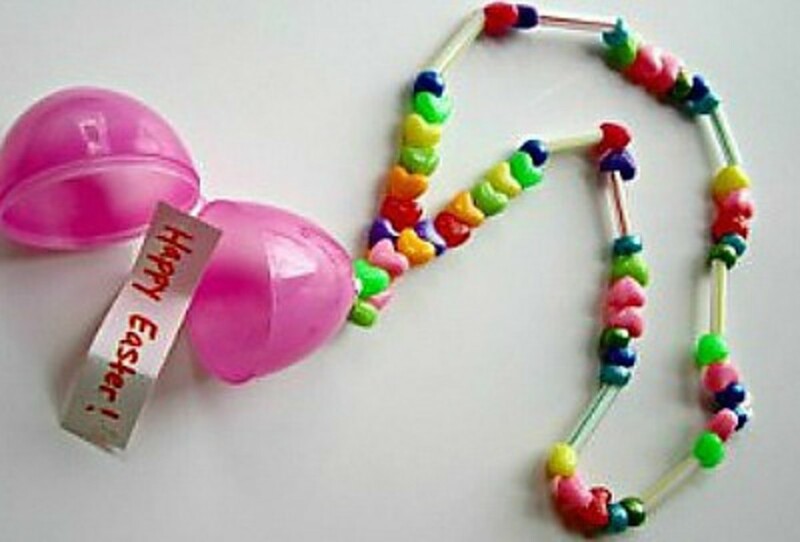 After a couple of years, we're thinking of making plastic egg crafts with all the extras. 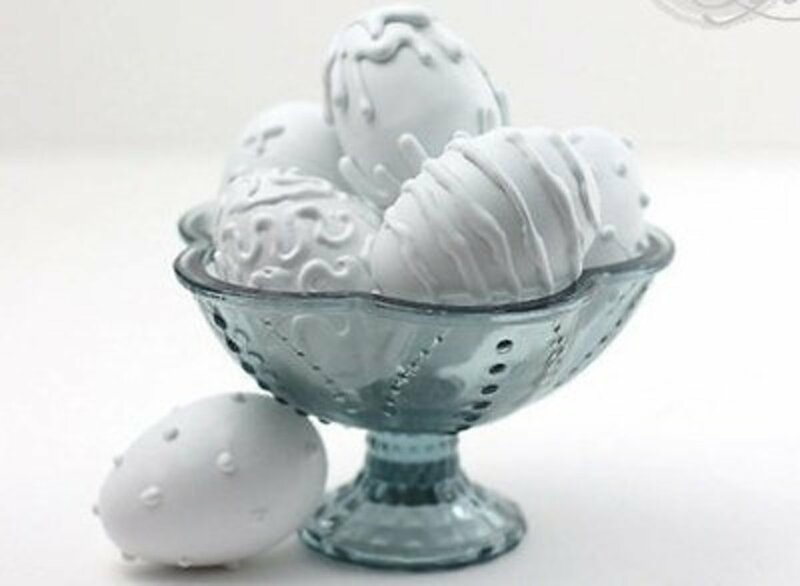 The plastic eggs come in a huge variety of colors and sizes, and can be decoupaged, painted over or glued to, and transformed into a nice decorator item. 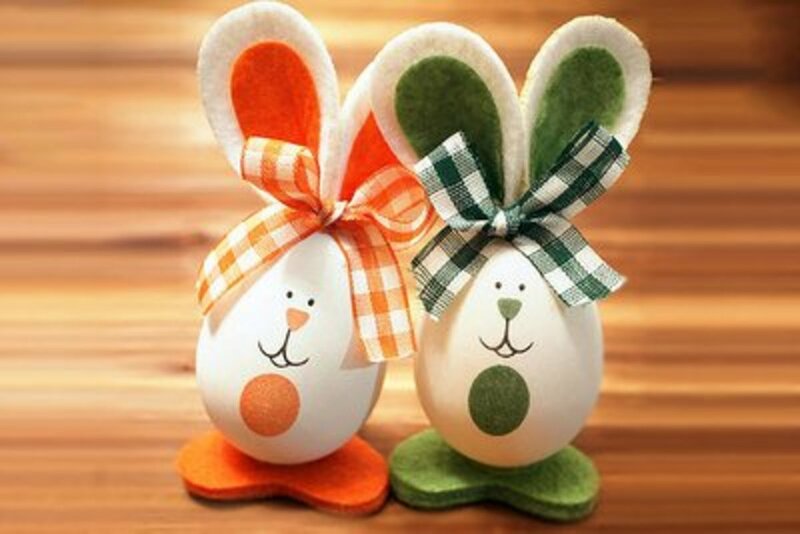 There are a few projects that use Styrofoam, wooden, paper mache or real eggs, but I'm of the opinion that plastic eggs could be used in their place, so these crafts are included here. For the tutorial to make the gorgeous, scrap happy eggs shown above, go to Family Circle. Pretty darned cute, and besides that they wobble. Fun to make and even more fun to play with. 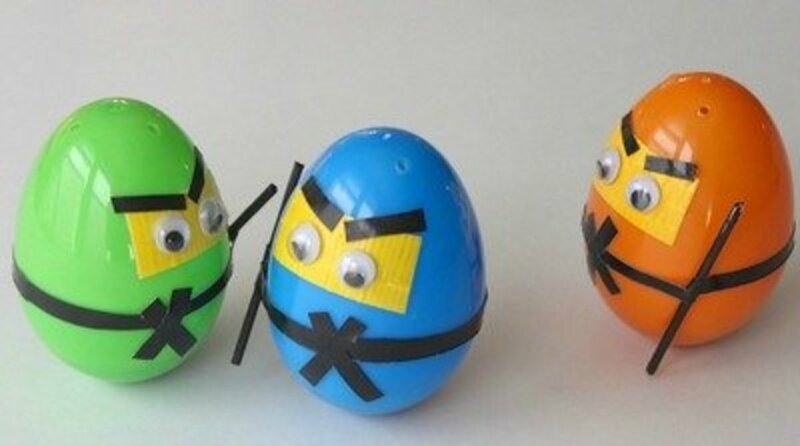 Find the instructions for making these wobble egg Ninjas at Frugal Fun for Boys. 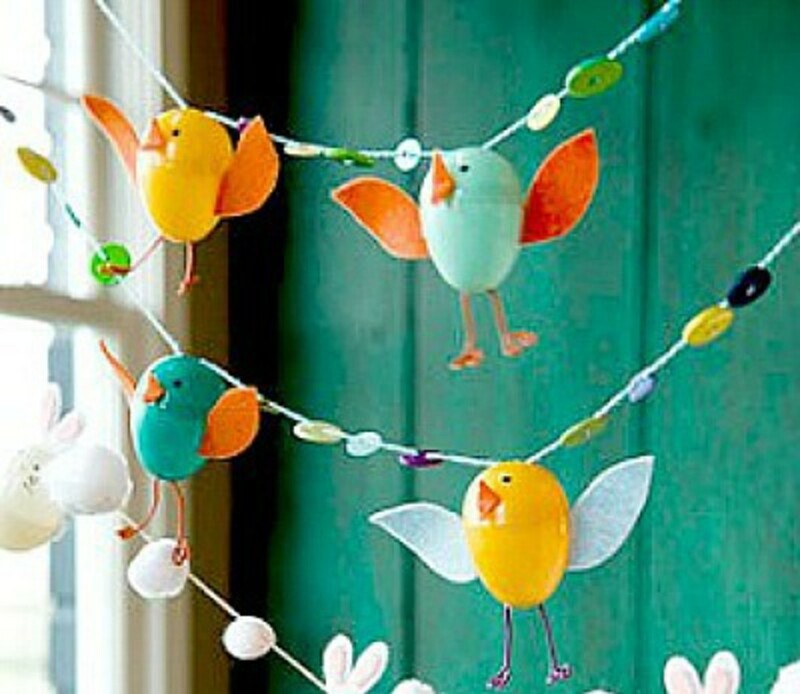 This is such a cute Easter craft idea that is easy to make and so special to display. 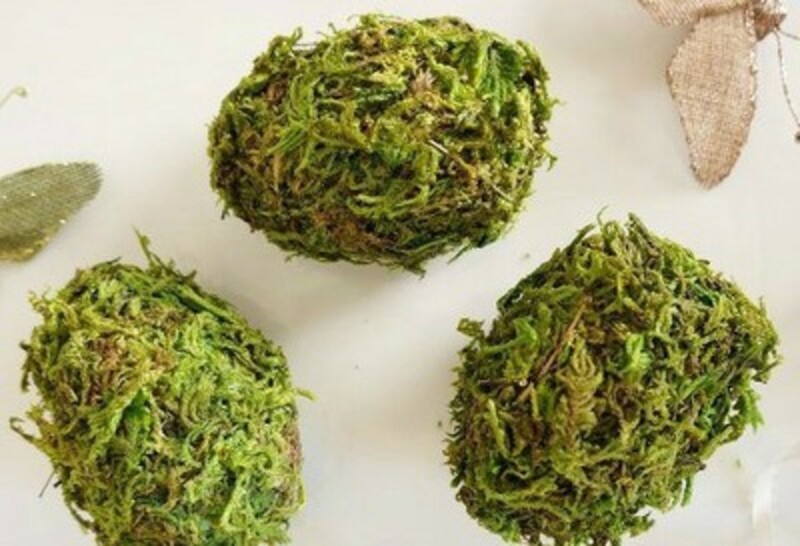 Imagine them in a nice basket, bowl or tucked in a centerpiece. Check out the instructions at Sweet Pea and then make some of these carrots for your home. 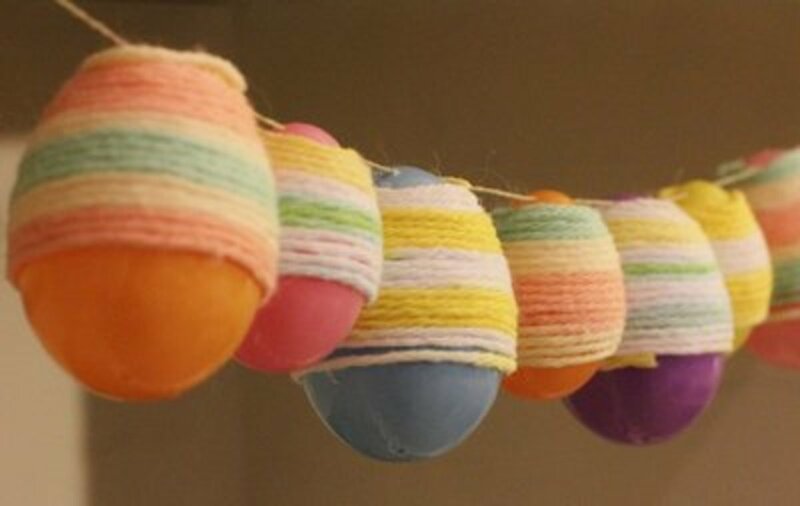 This yarn wrapped egg garland is so simple to make and so beautiful to look at. Imagine all the ways you could make this your own inspiration by changing the colors of the eggs or adding glitter, buttons, etc. Find the tutorial for making this garland at Picklee. Follow the instructions given at Mom Junction to make these little beauties. You'll have to scroll down on the page to get to this project. Looks like this would be a great tub toy for the little ones. 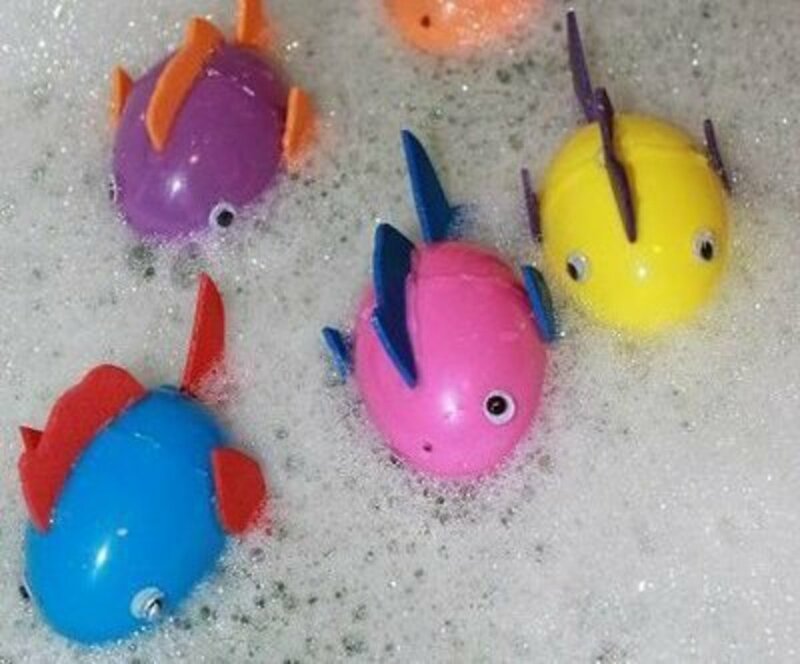 Find the tutorial for making these floating fish at The Pinterested Parent. 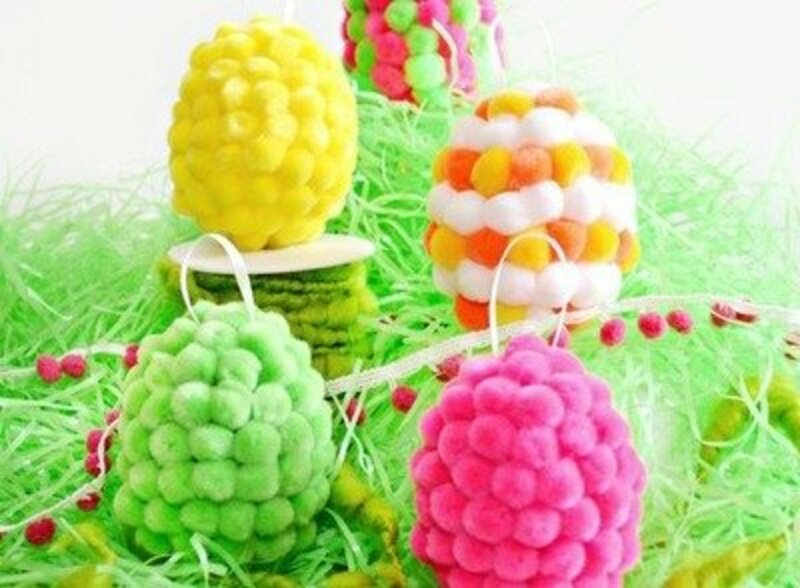 Use the wobble heads as a centerpiece on Easter and see how many comments you'll hear about how much fun it was to make them. Find the instructions for making these wobble heads at Crafting in the Rain. I don't have a fireplace, but if I did this is one craft that I know I'd want to make. This is perfect, especially during the summer months, when the weather is too warm to use the fireplace, but you want the ambiance of a glowing fire. 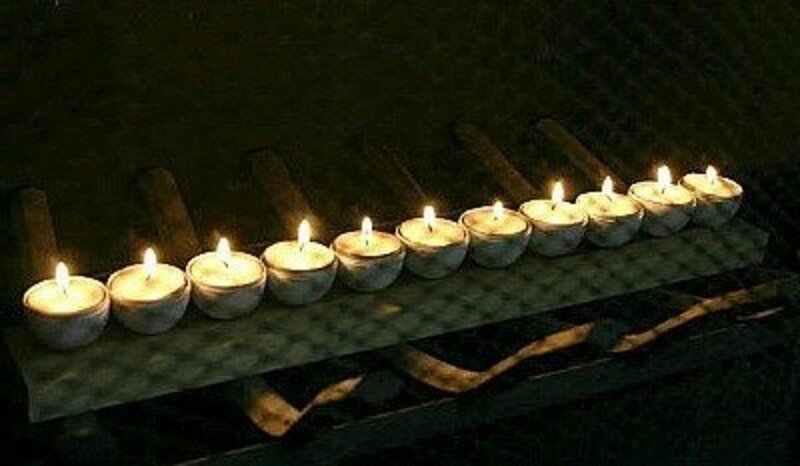 To make these tealights, go to TAYLORMADE for the tutorial. 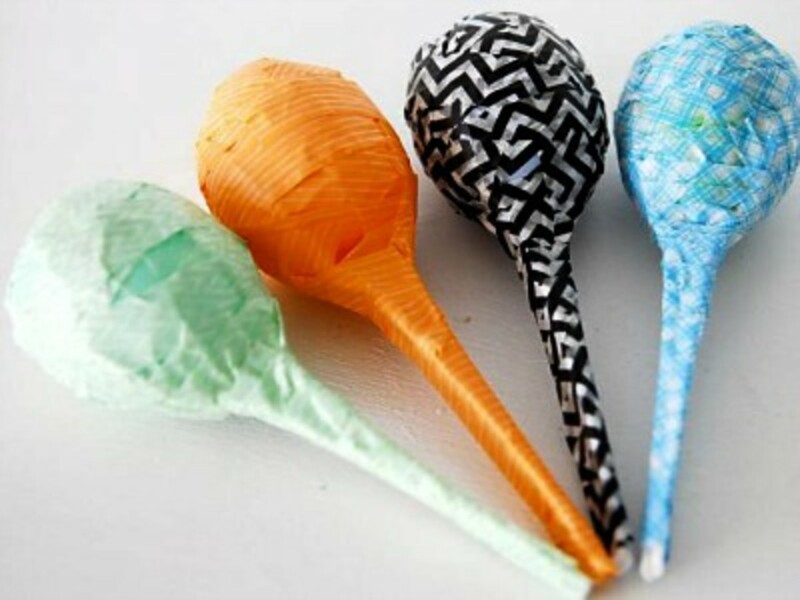 You don't have to wait for Cinco de Mayo to make and play these maracas. 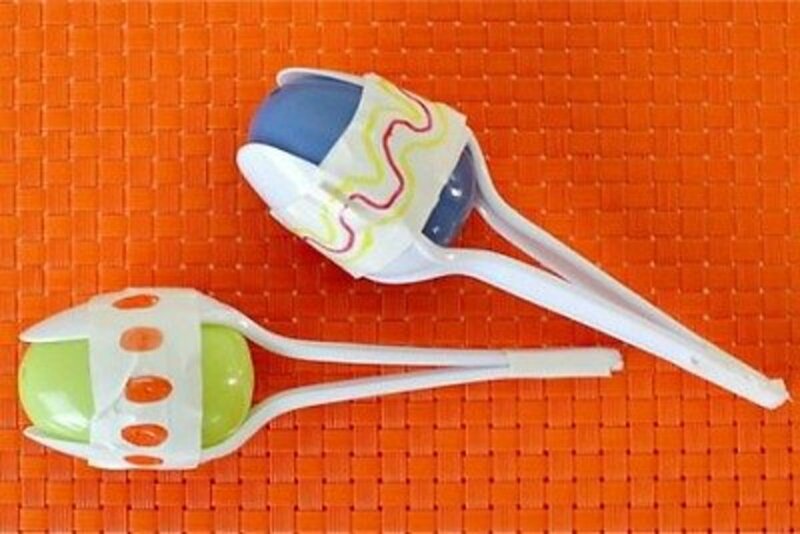 The directions for making these maracas is found at Made Everyday. Watching the birds gather around, to feed on the bird feeder that you have just hung out, is the pleasure you'll get after making the egg bird feeders. 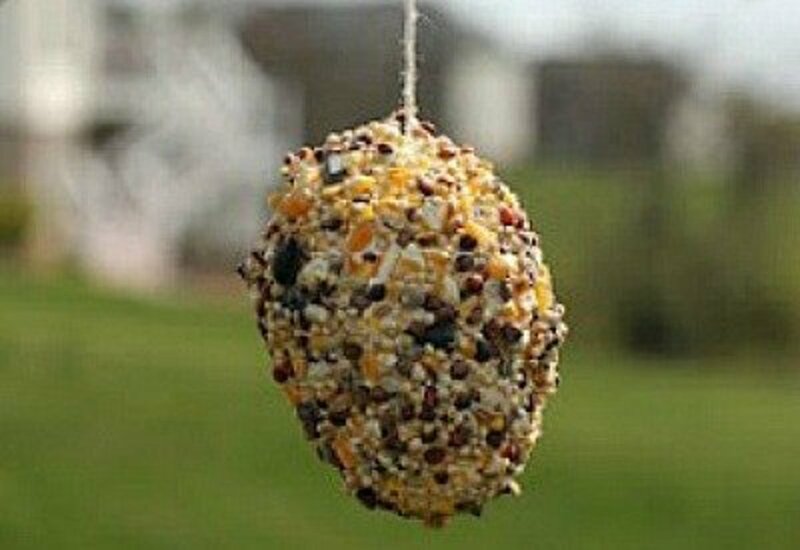 You'll find the instructions for making bird feeders like the one shown is found at playing house. 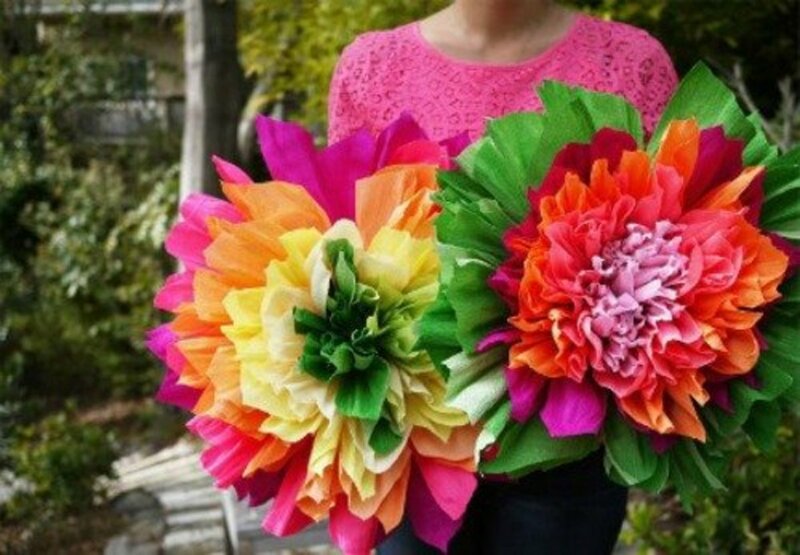 You can find the instructions for this really cute craft at apartment therapy. A sneak peek: the lights are LED flameless candles. This would be a perfect addition to a Tea Party Baby or Bridal shower party. 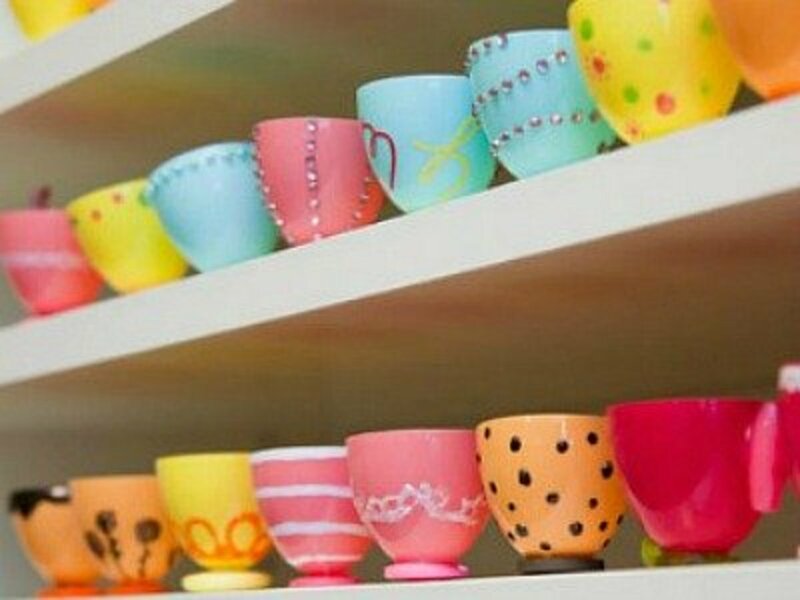 the tutorial for making these tea cups is found at Creativity in Progress. 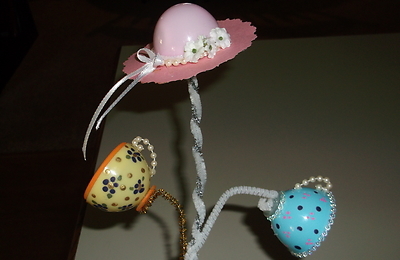 You'll see how to make the fancy, tea party hats to go with the tea cups for your party decorations at Making Teacups and Hats Using Plastic Eggs. Find a pictured tutorial to help make them. Nothing says, "Spring," like pastel bunnies and chicks. This combination makes for a beautiful garland to hang in a doorway or on the mantel. 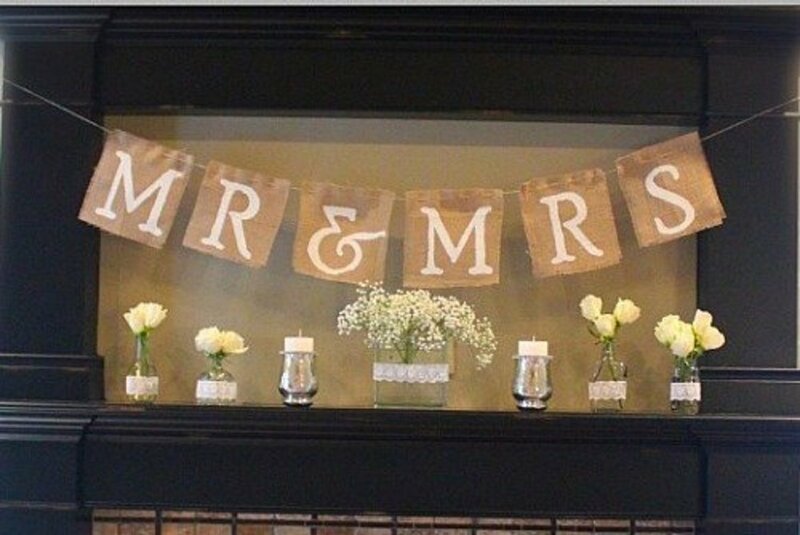 The directions for making this gorgeous garland can be found at Parents. Scroll down to #10 on the page. 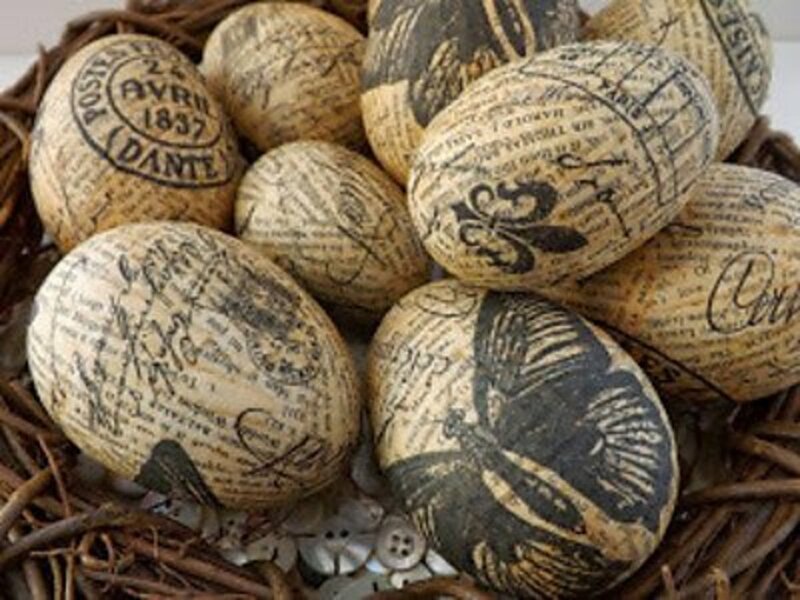 I love the rustic look of these eggs. I think a nice bowl of them in a bed of Spanish moss, would make an attractive Spring centerpiece. 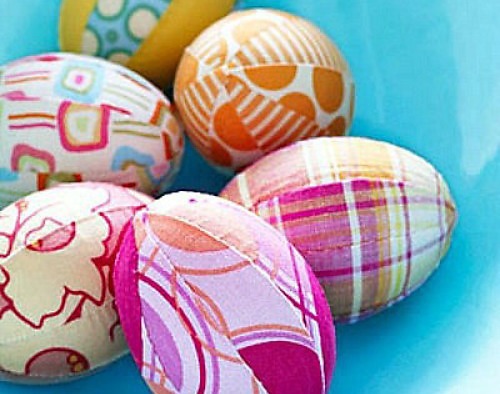 Find the tutorial for making these eggs at Let It Shine. 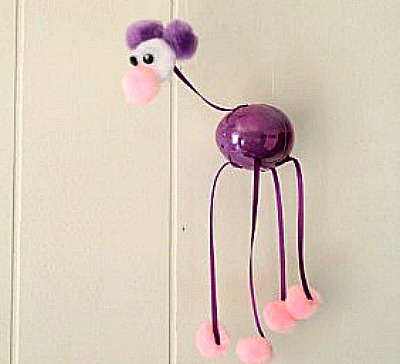 DOLLAR STORE MOM has a great tutorial for making this marionette puppet using recycled plastic eggs. Imagine the fun you'll have with this cutie. They call him "my silly bee" but I'd call him cute and cuddly. 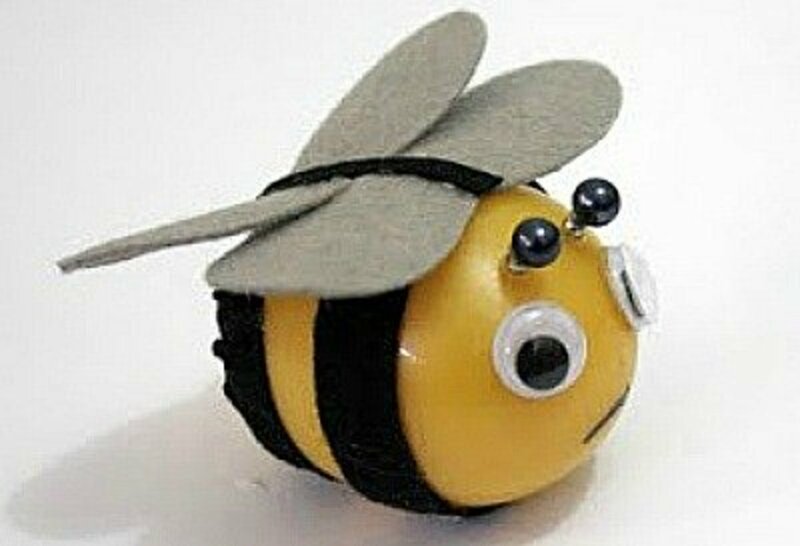 OF Pinks and Fairy Tales is the site where you'll find the instructions for making this cute and cuddly, silly bee. 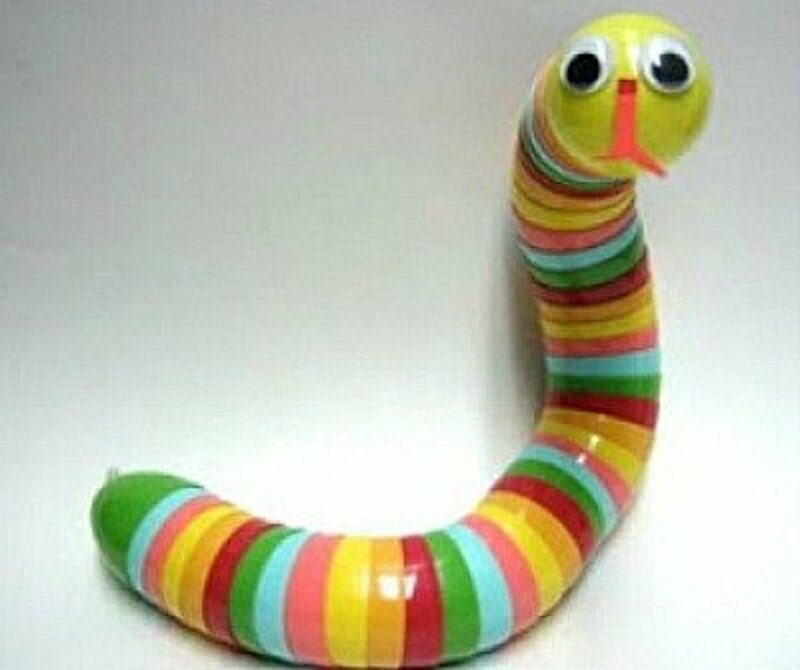 This will be an easy craft project for the kids.They'll even be able to make this snake by themselves. 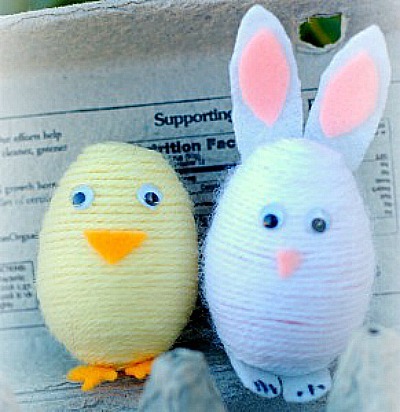 Check the instructions at Sewing and Crafting with Sarah, and supply the kids with a bunch of plastic eggs. 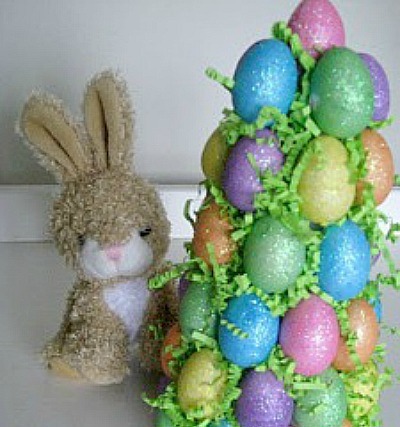 I'll bet you have the perfect place to display a beautiful Easter egg tree. 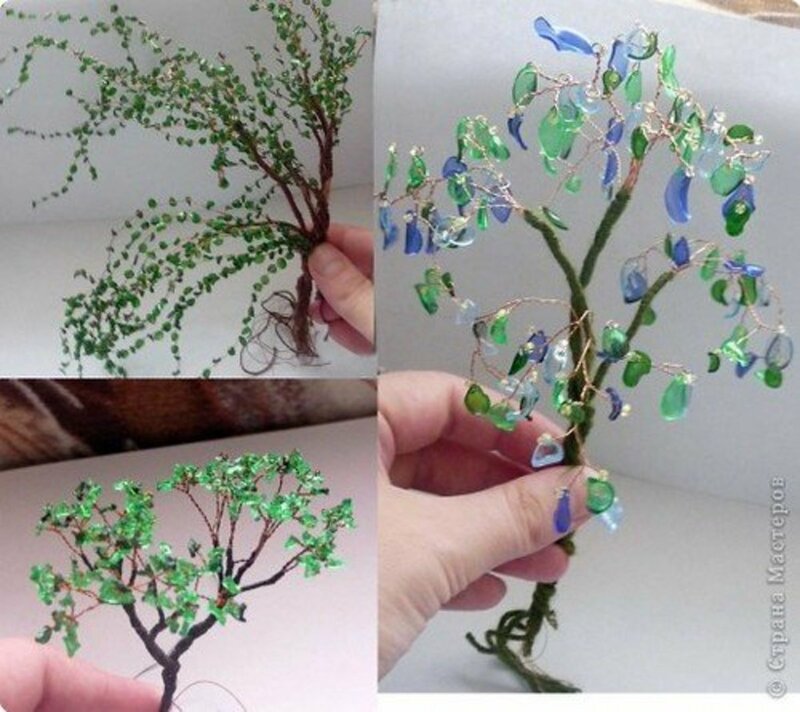 Maybe you can imagine the tree as a centerpiece or part of a centerpiece. Sweet Floweret is the site where you'll find the tutorial for this project. This wreath is super easy to make. You'll find the tutorial for making it at Sippy Cup Central. Again, these eggs are some that I wouldn't want to stash away right after Easter. I'd want to display them somewhere to add color or brightness to an area. 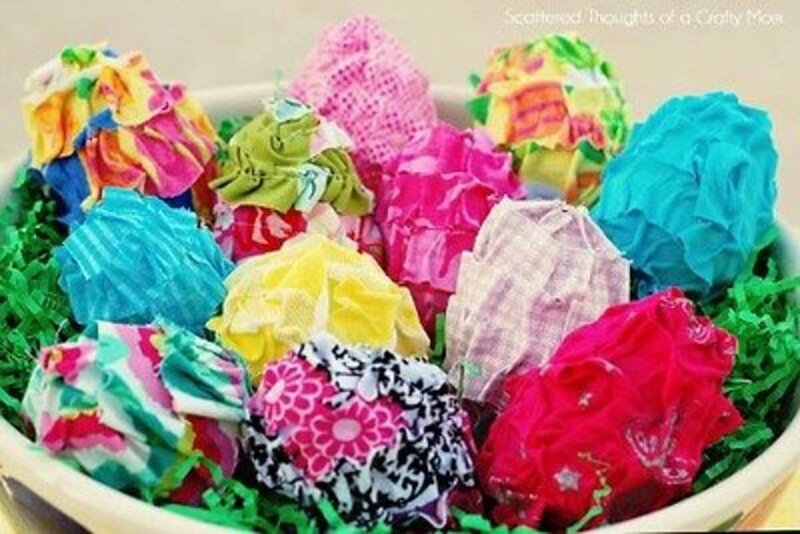 You'll find the tutorial for making these gorgeous ruffly eggs at Scattered Thoughts of a Crafty Mom. 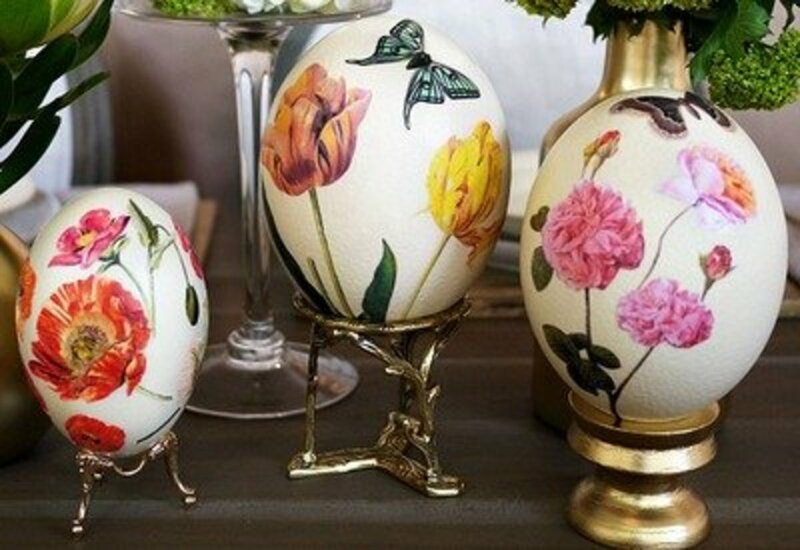 This is super easy and the decoupaged eggs turn out beautiful. 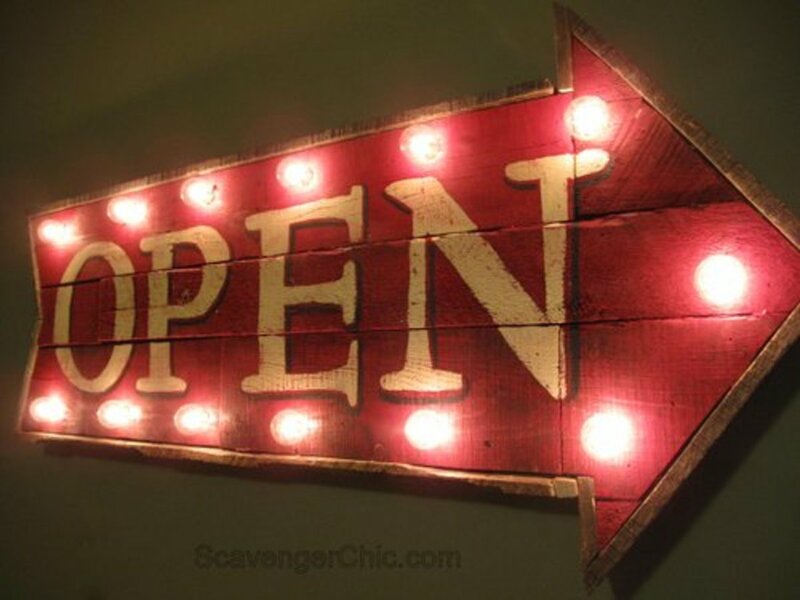 Find the easy to follow instructions at Red Ted Art. 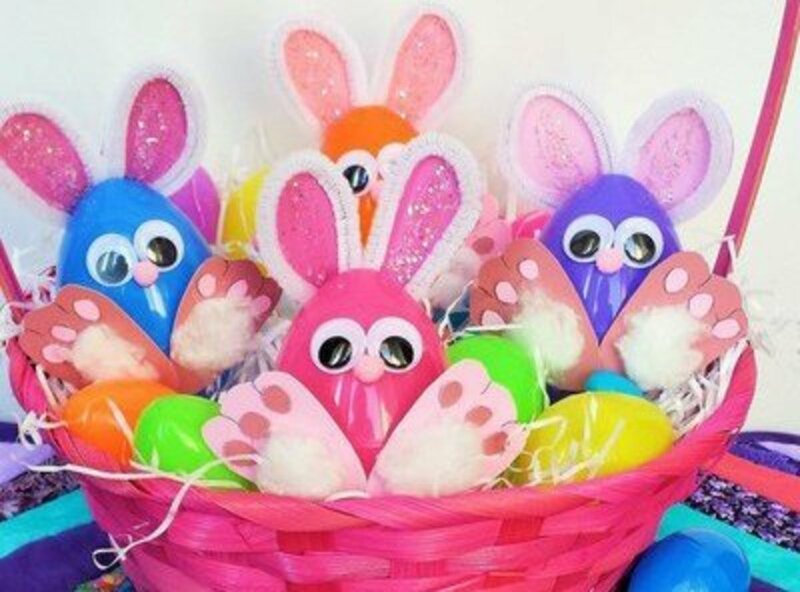 By using bright paper and ribbons you can craft outstanding Easter eggs like these, which have instructions at favecrafts. You'll find a very nice tutorial on the site. 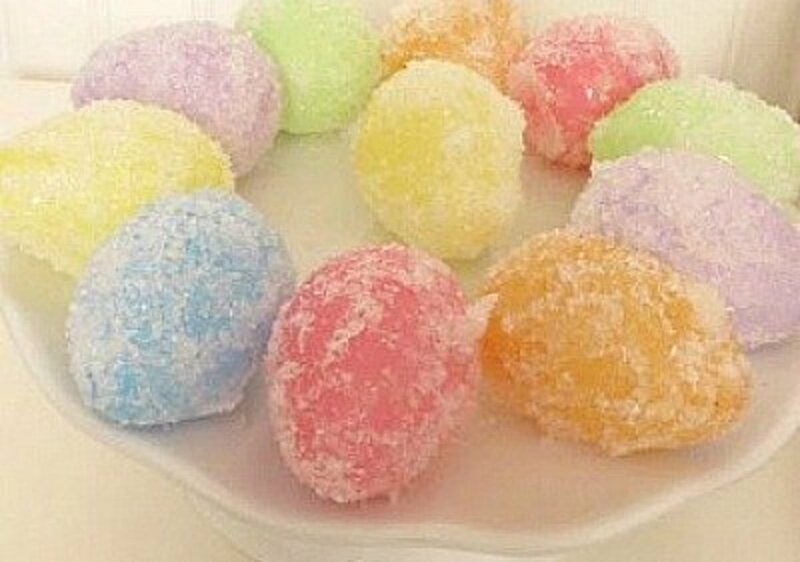 Even though these eggs look like they are sugar coated, they really are coated with epson salt. 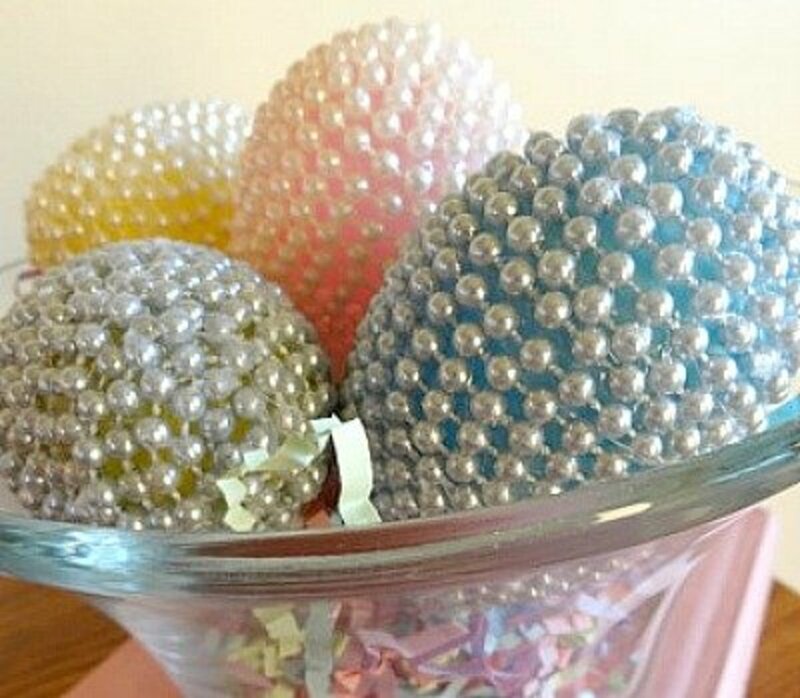 You'll find the directions for making these attractive, pastel eggs at hometalk. 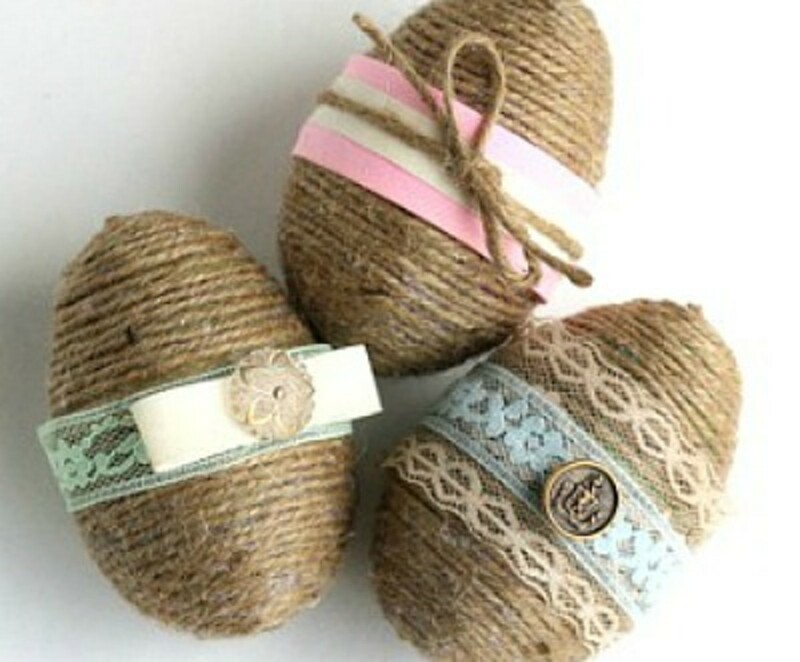 I have a hard time thinking of these eggs as an Easter décor, because the jute makes them a nice look for anytime of year. 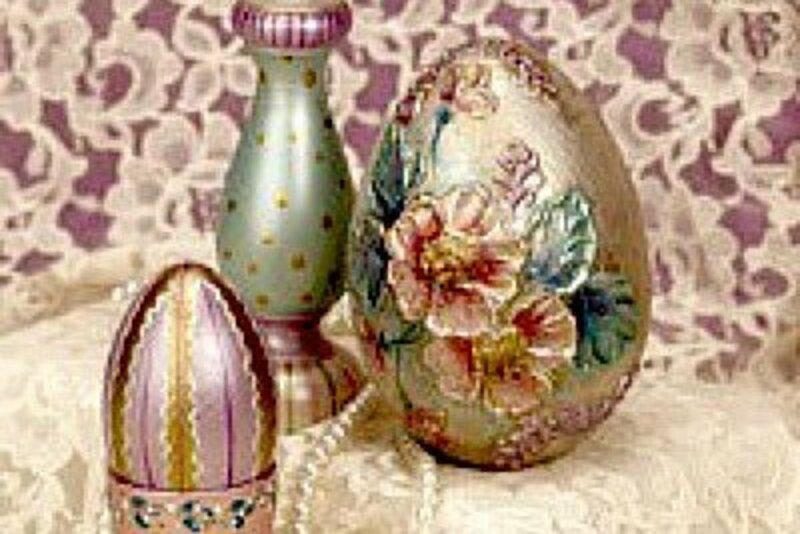 You'll find the tutorial for making these shabby chic eggs at Taryn Whiteaker. 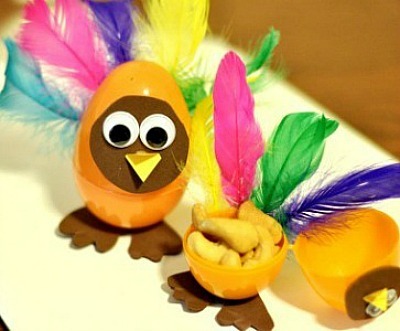 Be sure to save a few of your plastic eggs to make these Thanksgiving turkeys with the kids. You can find the instructions at WHAT TO EXPECT. Imagine all the different combinations of feathers you could use with this project. 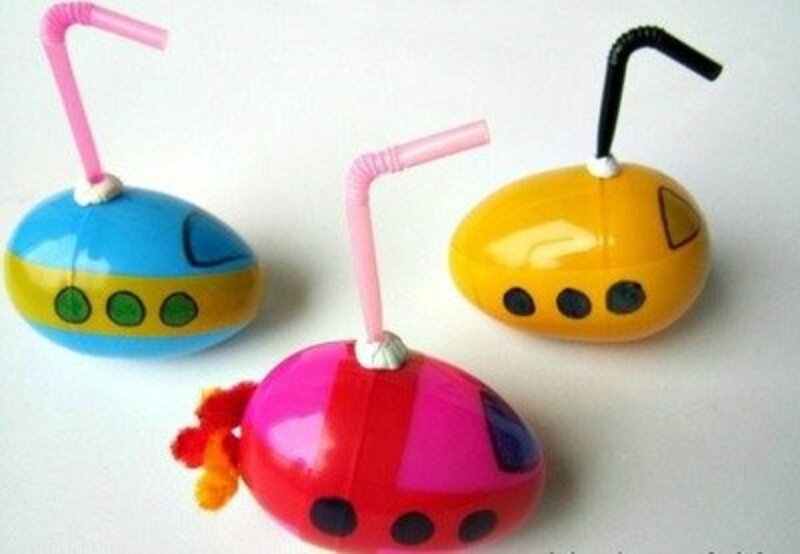 Help the kids make these egg shakers by following the instructions given on the Kangaroo Mama site. I can imagine a teacher finding this a great idea for her Spring classroom. The kids would be so interested in watching how the seeds grow. 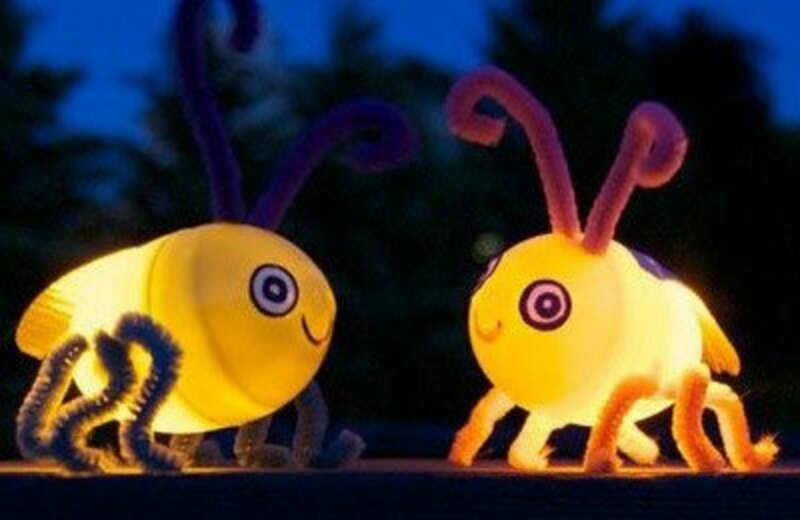 To make egg buddies like these, go to Busy Bee Kids Crafts.com for the directions. 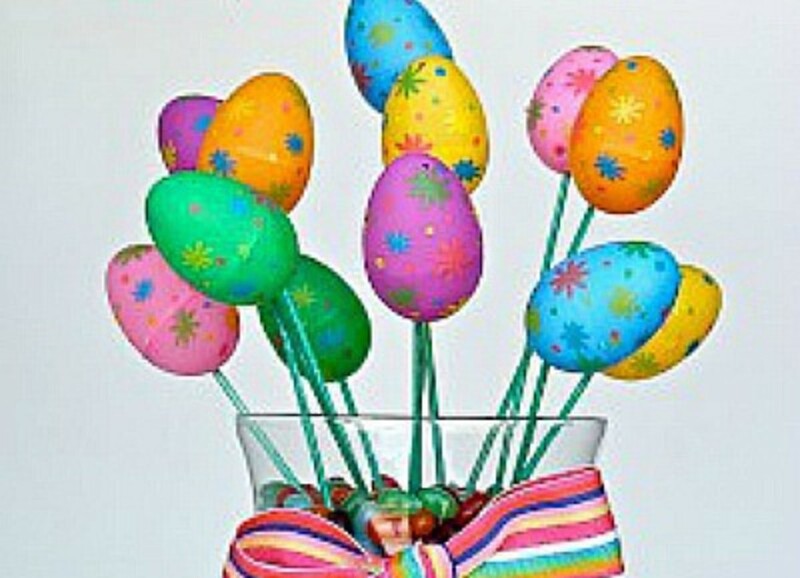 Make a beautiful Easter egg bouquet to give to your child's teacher to show her that you've been thinking of her. Or give one to Mom or Dad or a friend. Anyone that I know would appreciate this gift. See how to make this bouquet by going to a COWBOY’S wife for the tutorial. 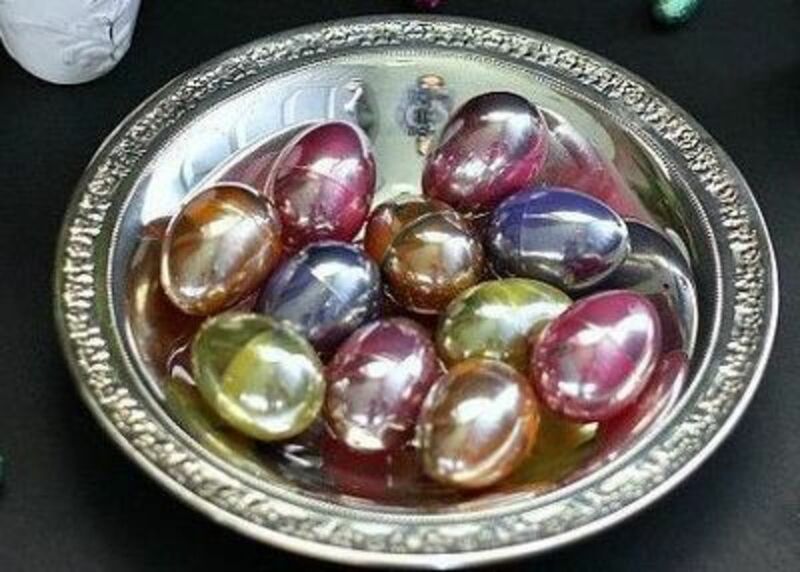 Elegant and gorgeous are only two of the complimentary words that I can think of to describe these eggs. 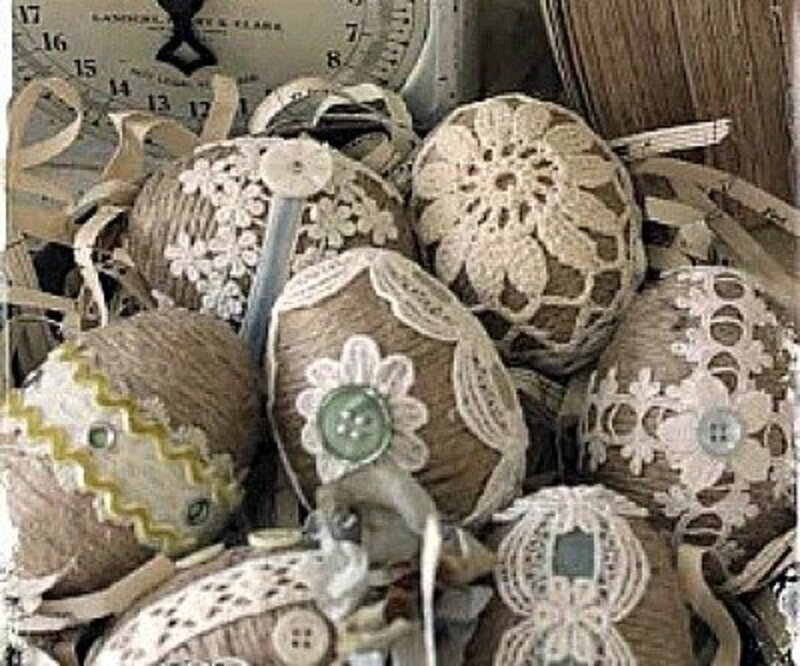 For the tutorial to make these twine and lace eggs, go to My Desert Cottage. 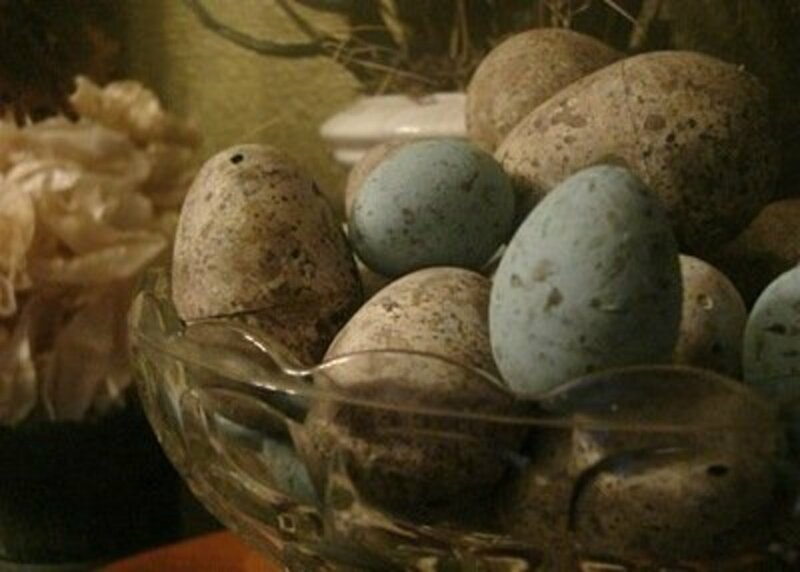 Are speckled eggs your favorite style? 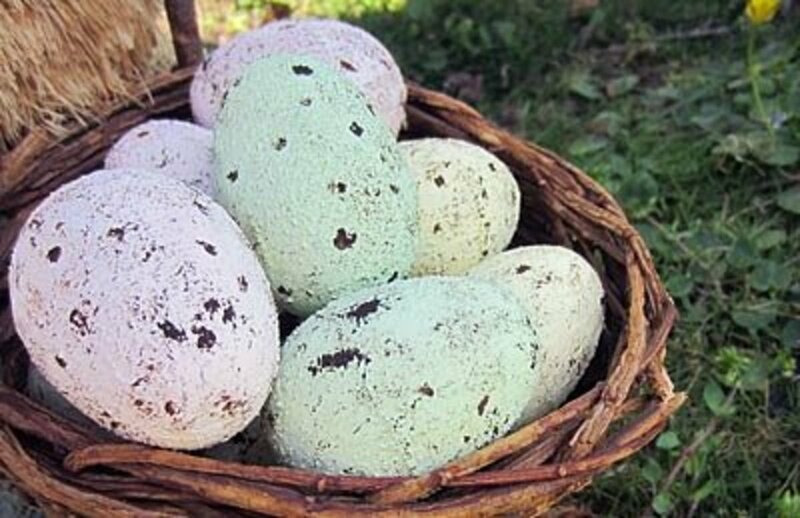 Making speckled eggs using plastic Easter eggs is a lot easier than you can imagine. 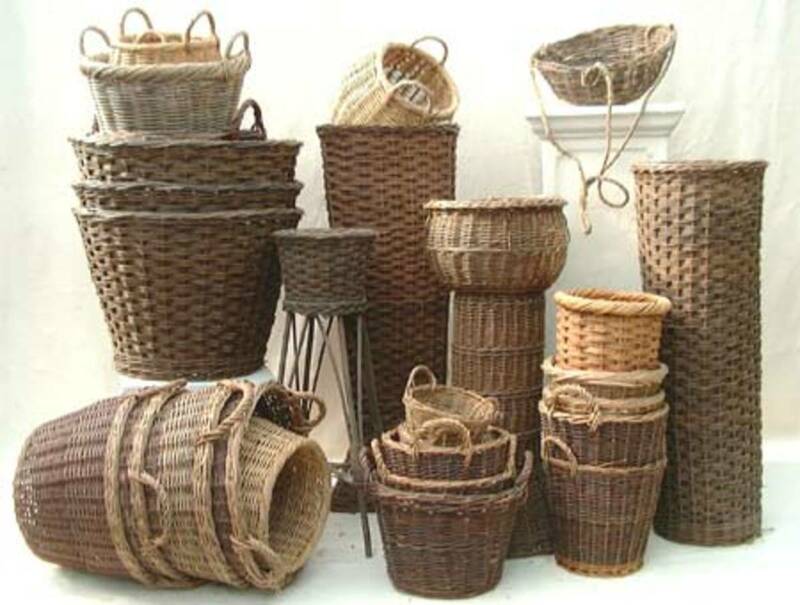 Find out how really easy they are to make by going to we know....stuff for the instructions. 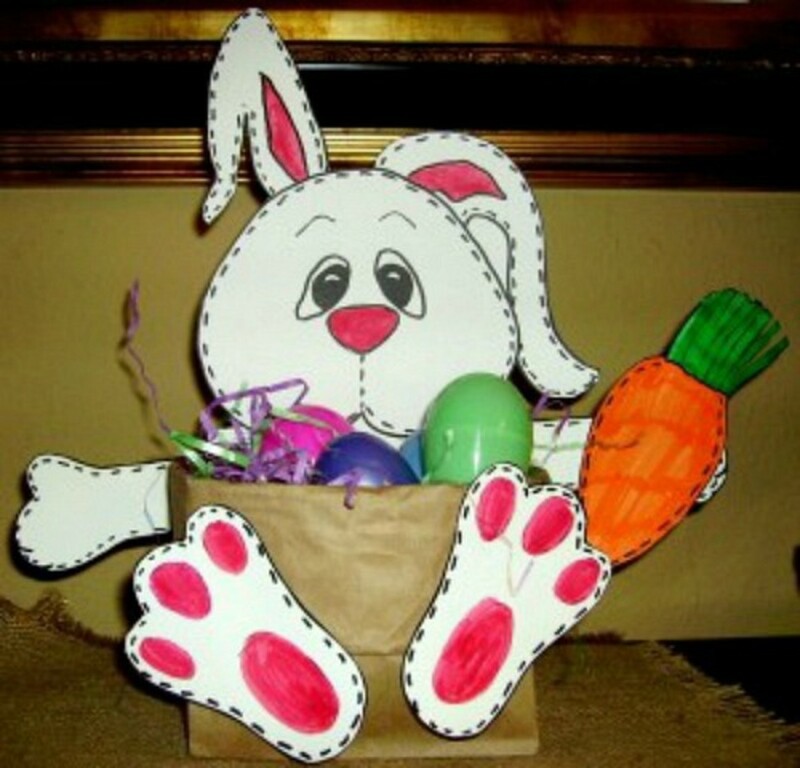 You'll find the tutorial for making these bunnies at Blessed Beyond Crazy. Super cute and easy to make. 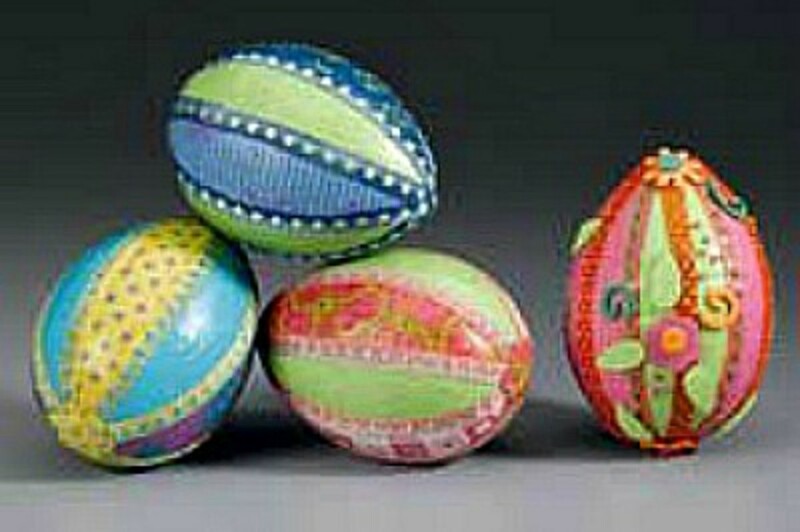 The tutorial at favecrafts uses wooden eggs to make these painted Easter eggs, and you may want to do just that. But, if the kids are going to paint Easter eggs, I would suggest using plastic ones instead. Just sand the eggs slightly to give the paint a rougher surface to adhere to. Then paint. 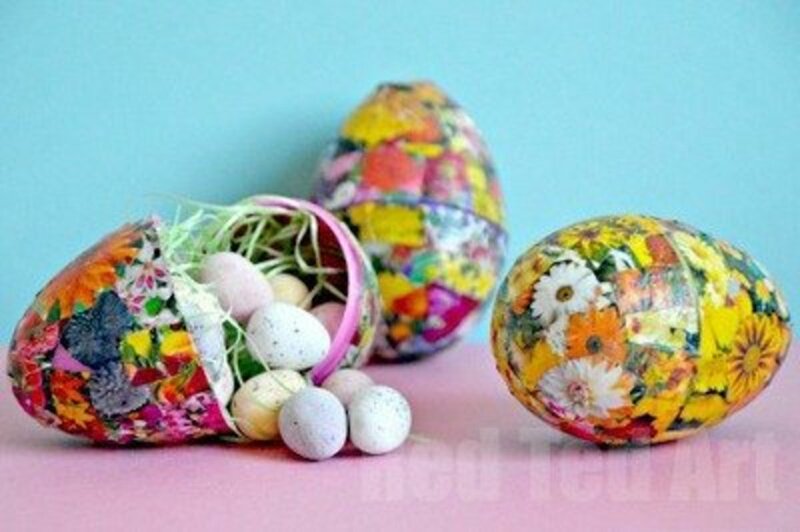 Make these gorgeous eggs using layers of washi tape strips. The instructions for this craft are found at Family Circle. Scroll down to #8 on the page for this project. 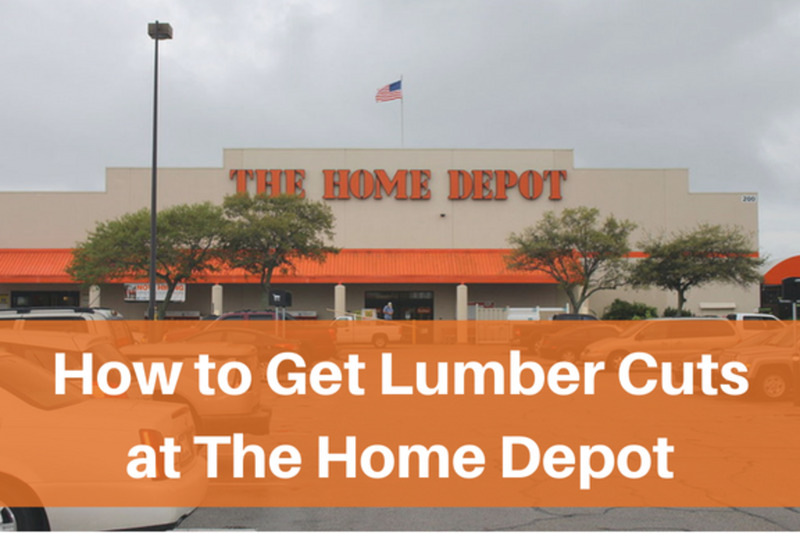 Here's another craft project that you're sure to love. 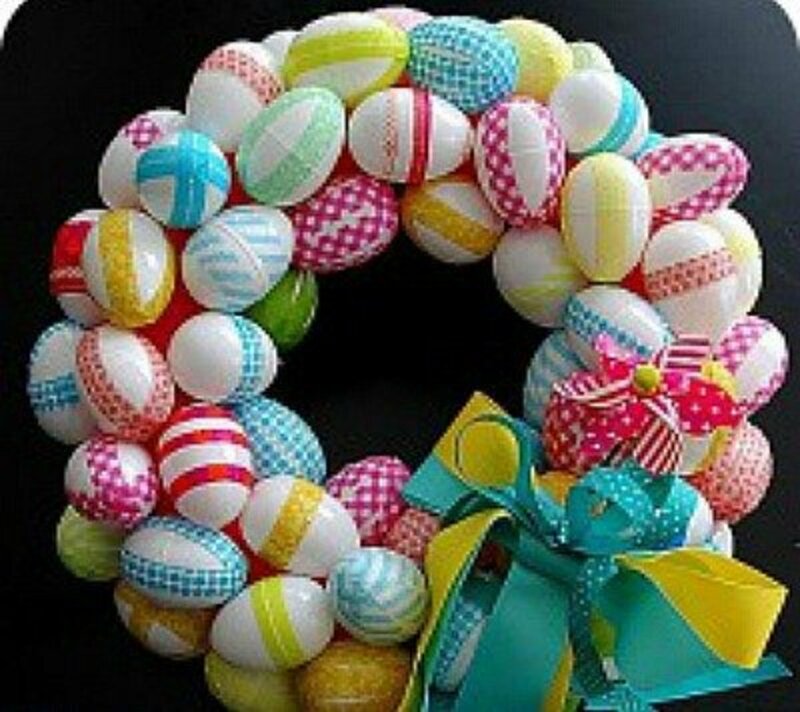 Grab a bunch of plastic eggs and a variety of washi tapes and make an adorable Spring wreath like the one shown above. The tutorial is found at tatertots & jello. 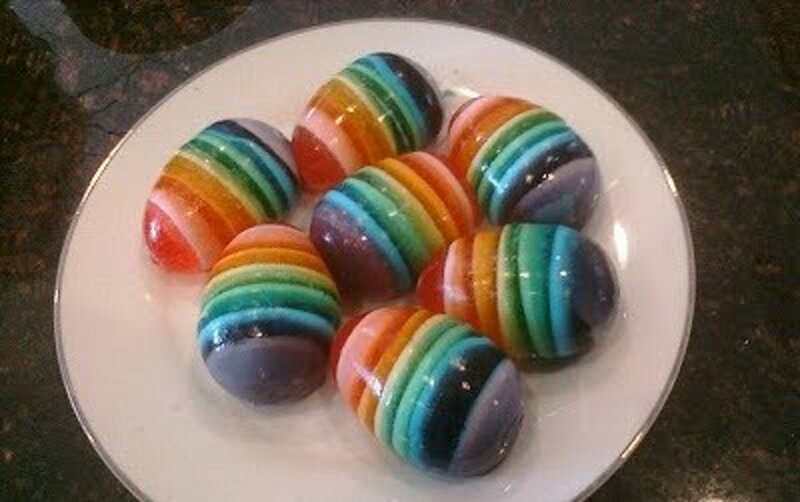 Did you know that you could use the plastic Easter eggs as jello molds? See how this is done by going to RobbyGurls Creations to see how it's done. 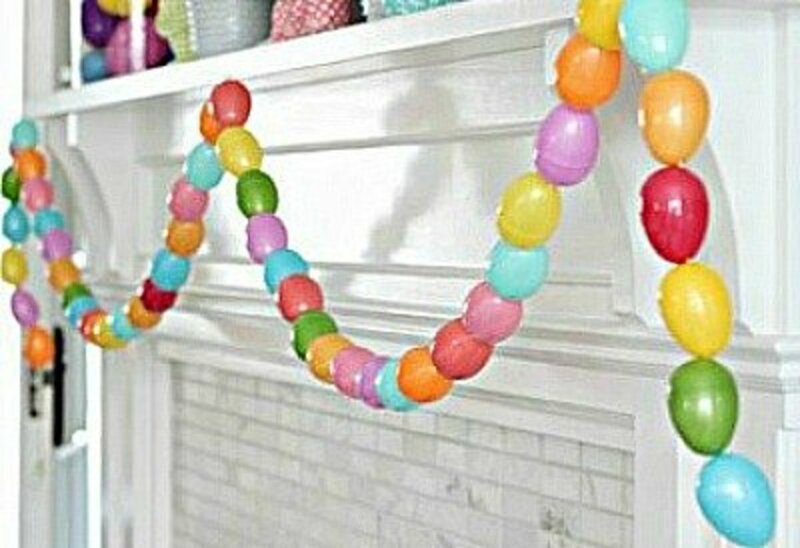 Although this is a very simple garland, it still is a very beautiful and colorful addition to your Spring mantel. You'll find the tutorial for this craft by scanning down on the page at Kelly Elko. These maracas are special because of they are covered with Washi tape, which gives them the special look. Make maracas for any occasion where you could use a little musical beat. Find the directions for making these maracas at kiwi crate. Consider having the kids make these secret message necklaces for themselves or to gift to each other. The instructions for making this necklace is found at ParentTeachPlay. 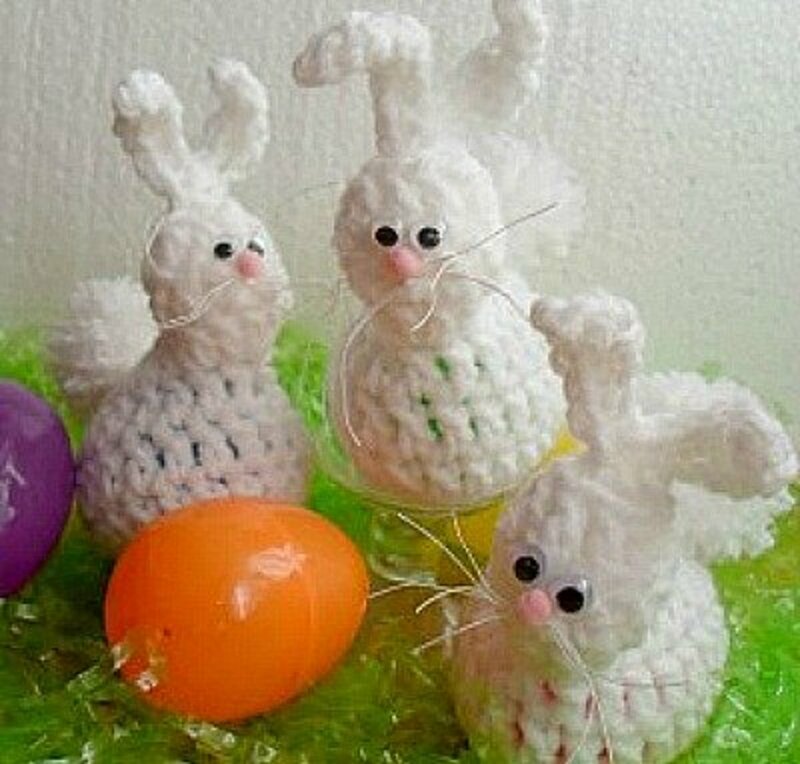 Plastic eggs are used to fill out the crocheted bunny bodies. You'll find the crochet directions at HAPPIER THAN A PIG IN MUD. 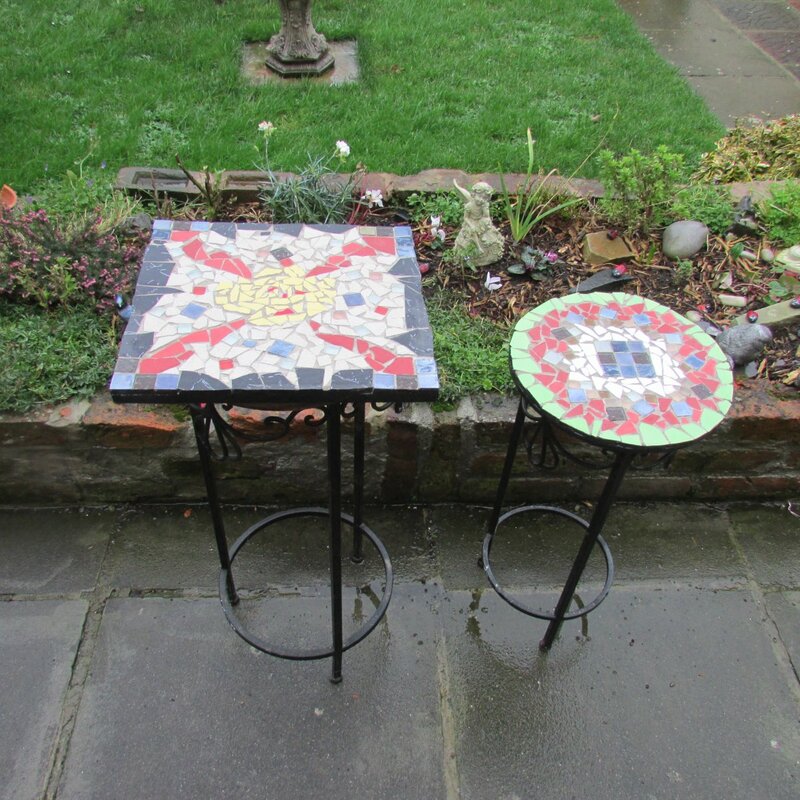 Another great classroom project. 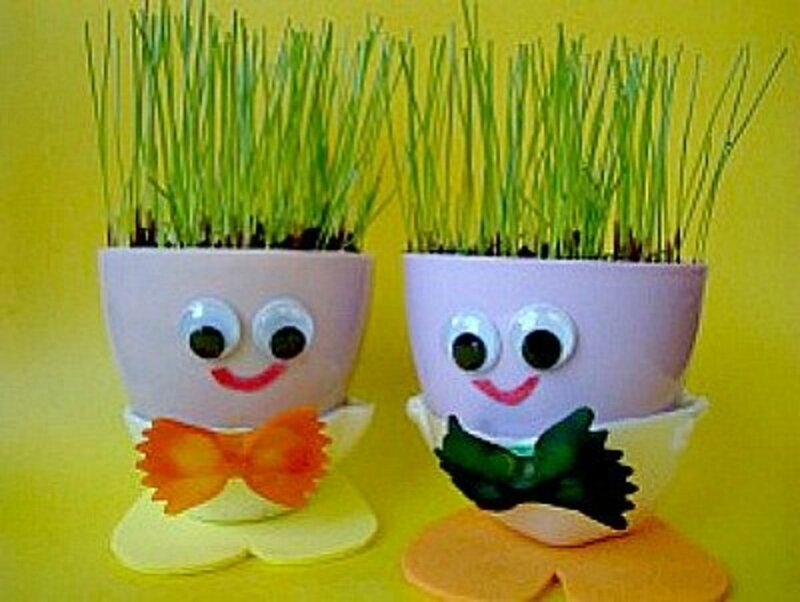 Right after Easter it'll be easy to have the kids bring plastic eggs to school to make hoppy friends like the ones shown. Find the instructions at Everyday Art. This is also a project that calls for paper mache eggs, but I'm sure that the plastic ones can be used if you roughen up the surface a little with some sandpaper. You'll find the tutorial for making these beautiful, elegant bunnies at 504 MAIN. Elegance in simplicity. Find the tutorial for this project at Little Miss Celebration. I love, love, love these beautiful eggs. Definitely a winner. Get the directions at Sew For Soul. 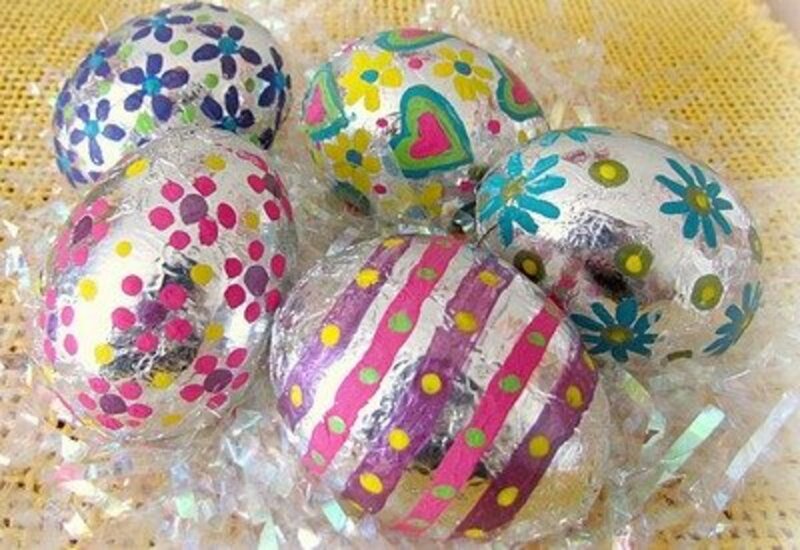 These eggs are covered with tinfoil and then decorated with craft paint. Very cute and super simple. The directions are found at SUZY’S SITCOM. I can imagine the kids would love to make these submarines, especially if they would play with them in a basin of water. For the instrucitons go to ADVENTURES AND PLAY. 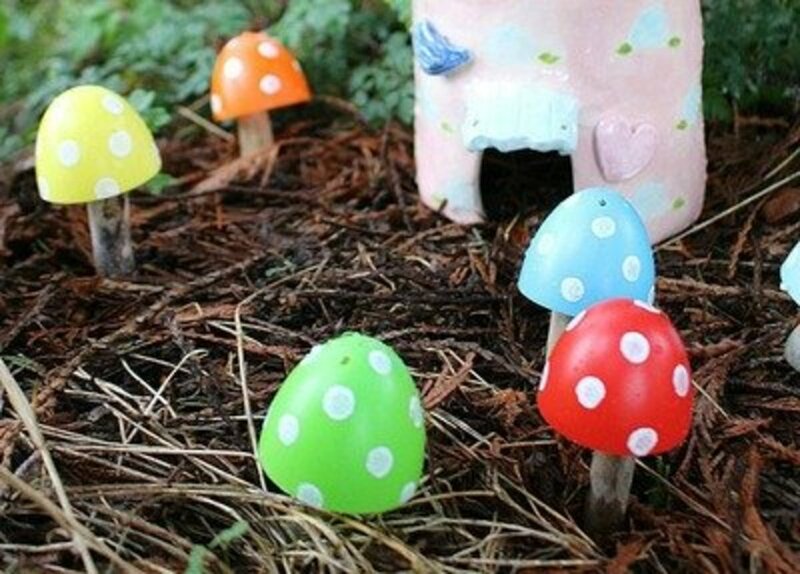 I plan on making some of these to add to a planned fairy garden that will be located under a large blue spruce. The tutorial for this project is found at ARTZY CREATIONS. Although gluing moss to plastic eggs doesn't seem to be a difficult craft, diy inspired gives some terrific tips to make the project less messy. 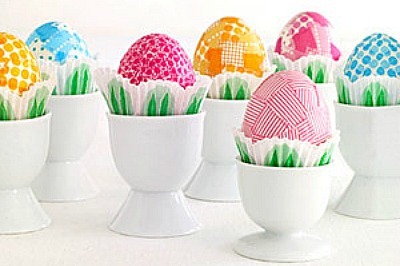 I think these little eggs would be a cute baby shower theme. Find the tutorial at PAJAMA CRAFTERS. 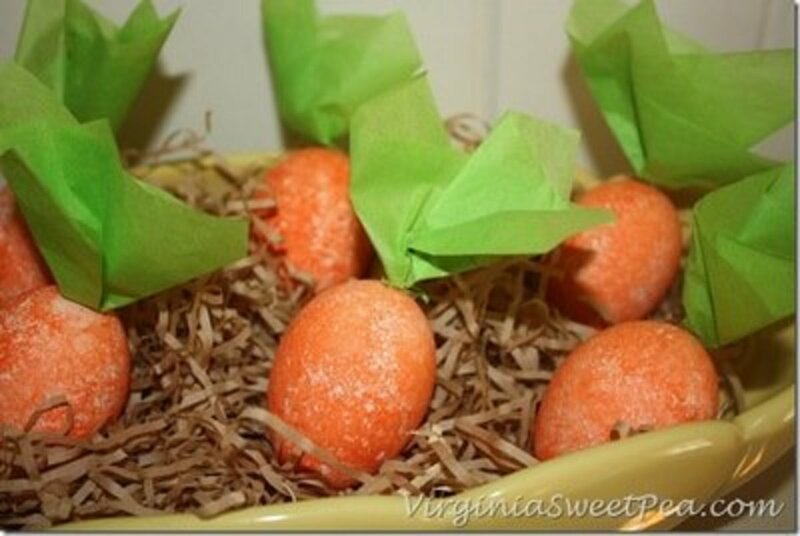 The eggs used in this craft, with a tutorial at HONESTLY YUM, aren't plastic eggs. I love this idea so much though that I think I'll try it with one of the large ostrich sized plastic eggs. I may have to tie jute around the center to cover the center slit, but that could look great too. Time will tell. 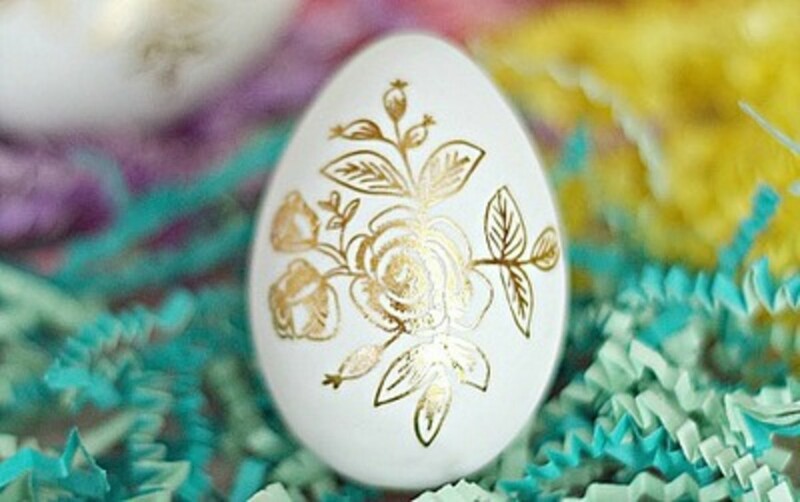 I don't know much about gold foil tattoos, but this egg is sure pretty. You'll find the tutorial for this project at DIY CANDY. 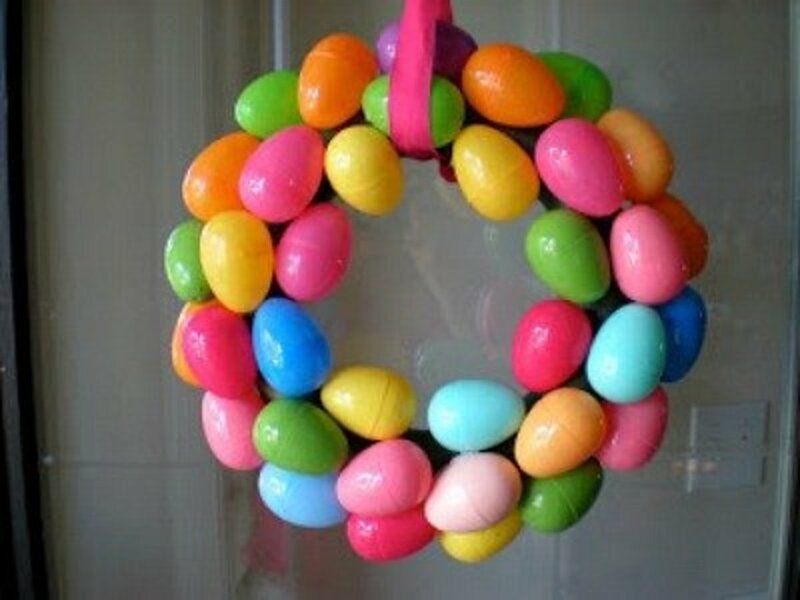 I like the idea that the beading is the same color as the plastic egg, but the egg could be painted if needed. Go to Puddy’s House for the directions. This is another time I'd want to use a larger sized plastic egg. Our Peaceful Planet shares the instructions and shows a photo of the egg displayed in a cloche. Impressive. The beauty of this bowl of eggs is it's simplicity. To make these textured eggs, go to The Kim Mix Six for directions. 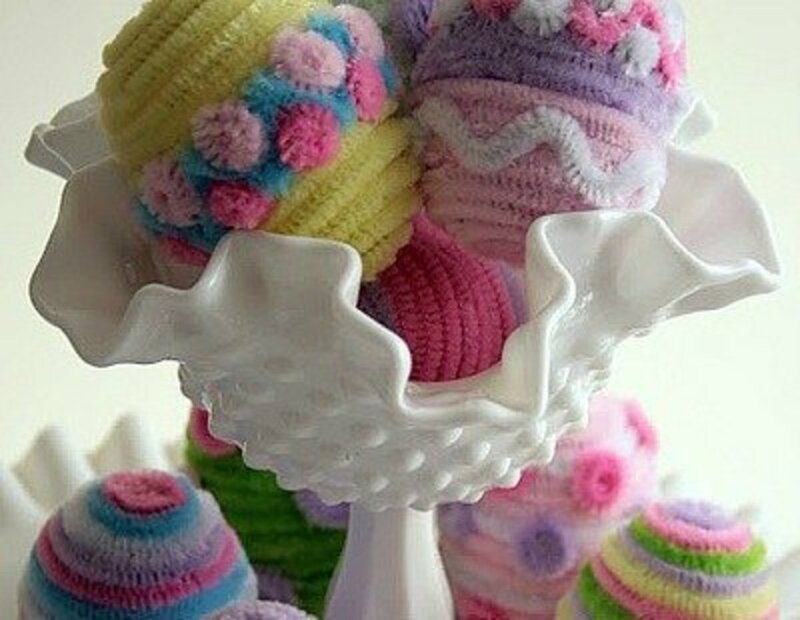 You'll find the tutorial for making these beautiful eggs at Hometalk. 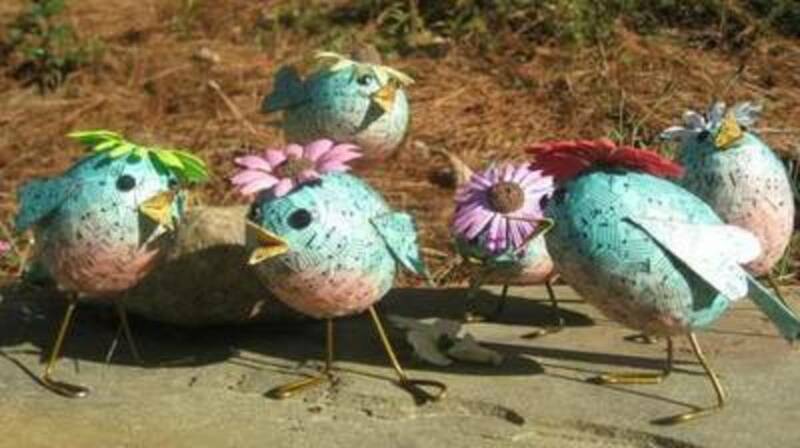 You'll find a terrific pictured tutorial for making these rackybirds at Craftster. 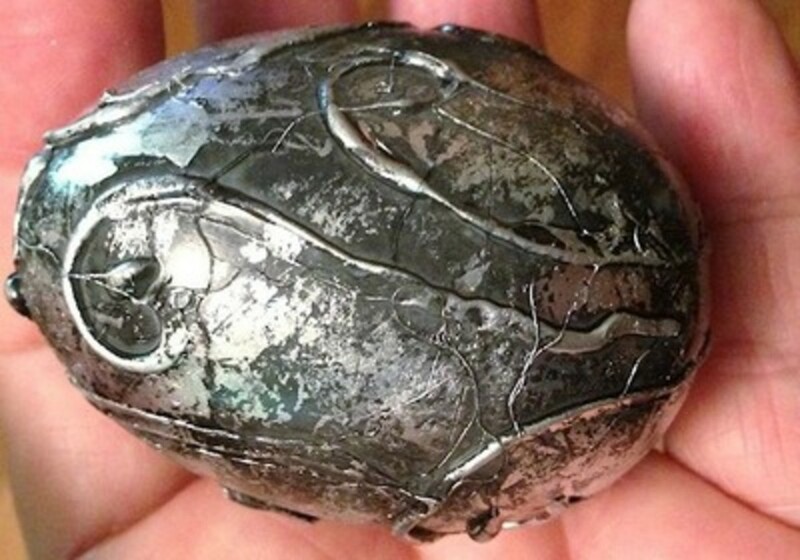 Would you craft using plastic Easter eggs? - Or leave a note to say Hi. Working on a few now. You have found so many cute ideas. The Eggimals and Fireflies are adorable, but the painted eggs are my favorite. I didn't realize there were so many ways to use them! Great ideas! Interesting and intriguing from beginning to end, Ibrummer! All of these are so cute! What a ton of fun ideas that I bet kids would enjoy too! Love the wreaths too. Great lens. You've given me so many new ideas! 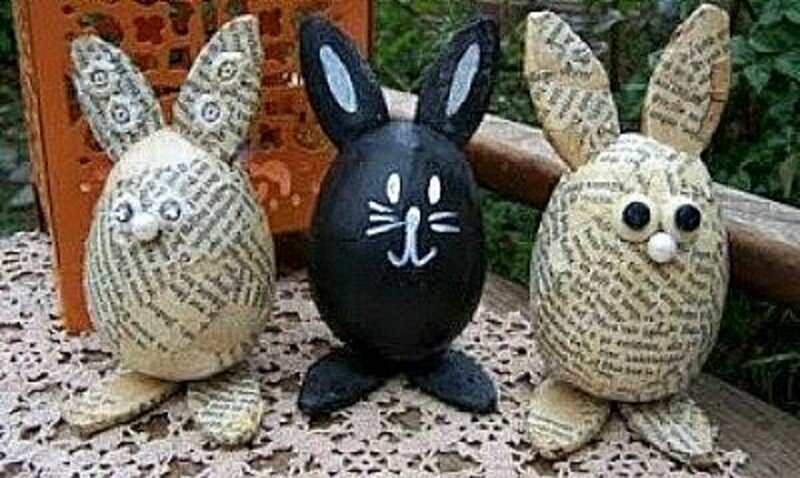 I love the paper mache egg, book page bunnies! These are all so cute I don't know where to start!!! Great lens and ideas!